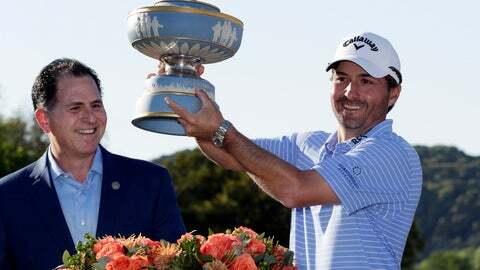 A week that began with a loss ended with the biggest victory of Kisner’s career when he holed a 20-foot birdie putt to close out Matt Kuchar, 3 and 2, in the chilly championship match Sunday at Austin Country Club. Kisner, equipped with a 2-up lead, took it from there. He halved holes by making putts from 6 feet and 4 feet, and then seized control on the 15th when Kuchar’s chip was too strong and led to another lost hole. He won for the third time in his career, this victory worth $1,745,000. BILOXI, Miss. (AP) — Scott Parel made a 12-foot par putt to match Kevin Sutherland on the fifth hole of a playoff before play was suspended because of darkness in the PGA Tour Champions’ Rapiscan Systems Classic. McCarthy finished at 16-under 272 on The Landings Club’s Deer Creek Course. The 33-year-old former Le Moyne College player jumped from 119th to eighth in the points race for 25 PGA Tour cards.